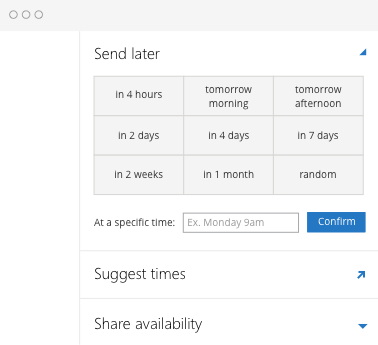 Schedule email in Outlook in seconds, and hit your recipient's inbox at the perfect time! Schedule email with Outlook's premier productivity add-in, and your messages will automatically get sent at the time you chose, even if your computer is off. You can even set follow-up reminders if your scheduled emails don't get a response! If you are not using Boomerang...you are missing out! Hit your recipient's inbox at the perfect time and increase your odds of getting a response. Set up a year's worth of payroll reminder or birthday emails in a day. Hide your late-night email habit by sending midnight emails out in the morning as you sleep in. Schedule Email to Get It Read and Responded to More Quickly! A well-timed email is 30% more likely to be read than a poorly-timed one. Boomerang for Outlook's send later feature lets you write a message now, then have it delivered whenever is best. If you're drafting an email on your way out of the office on Friday, you can schedule it for Monday morning, rather than send it immediately. Your email will be more likely to get read, as it will hit the top of your recipient's inbox when they return to work on Monday, rather than be buried under the rest of the emails they got over the weekend. Once Boomerang for Outlook is installed, you can find the "Send Later" option in both the Office Ribbon on Outlook 2013 and Outlook 2016, and in the Add-Ins bar on Outlook.com and Outlook on the Web. Simply click a prepopulated time for your email to send, or manually define a custom send later time, down to the minute. Click "Confirm" and you're done! Need to make changes your scheduled messages? No problem. Boomerang's Manage Page allows you to reschedule, cancel, edit, or immediately send any (or all) emails in your scheduled email queue. Boomerang is an awesome tool that allows you to schedule your emails to send at a later date or time.